In the end, who pays the bill for someone’s happiness? Susanne has ordered a baby from India and it is Padma’s task to give birth to it. Padma’s son Sani dreams of a pair of football boots and a new ball, but they can only be realized after the baby has arrived. TV meteorologist Peter has been taken off the air. He’d give anything to be able to stand in front of the weather map again and forecast the arrival of a heatwave. Seasons are capricious in the Nordic countries: for six consecutive years, the spring has given way directly to the autumn, without the much-awaited bliss of summer in between. Will the seventh spring finally usher in the summer? After years of waiting and hoping, will your dreams eventually come true? The Seventh Spring is a scorching portrayal of the world where even small choices lead to significant consequences. The hopes and fates of seven individuals far from each other are intertwined in a surprising way. Planning and yearning, each of them looks expectantly to have their dreams fulfilled, but in the end life surprises them all. 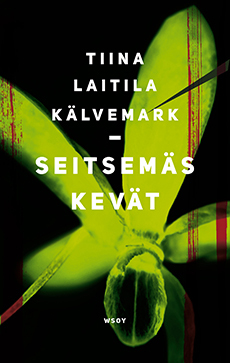 Tiina Laitila Kälvemark’s intriguing novel takes the reader to remote corners of the world: from Scottish parks and from Indian surrogacy clinics to luxury homes in Stockholm and to a certain log cabin in Northern Finland. The Seventh Spring is a study of greed, of love and of the price of dreams. Who will pay the final bill and for whose happiness?